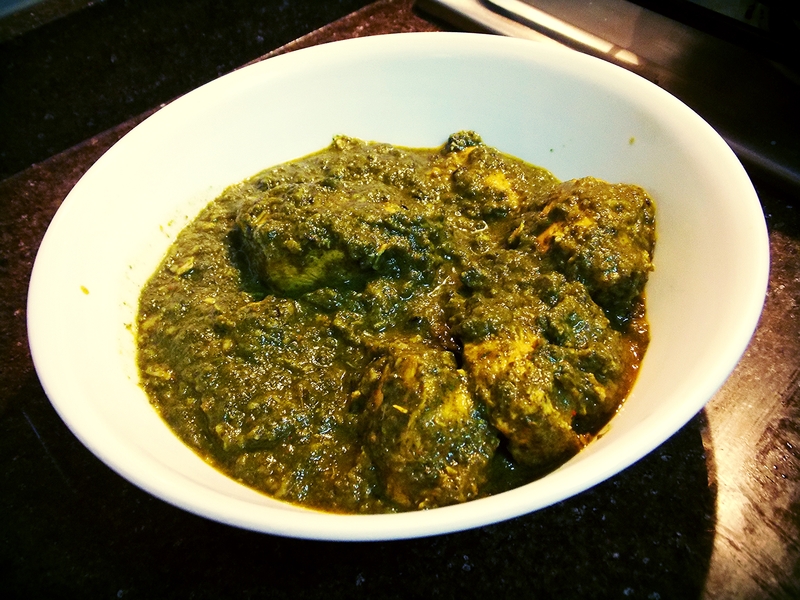 Experience the unique taste of Spinach (Palak) and Chicken (Murgh), cooked with flavoured spices. A great way to get vegetable and protein in one dish. 6 strips of boneless chicken breast marinated with oil, garam masala, ginger paste, garlic paste and natural yogurt for min. 45 mins. (for best results marinate chicken and keep in the refrigerator for 6-8 hrs. before cooking). Add salt to the marinade 10-15 mins. before cooking. Grind the onions and tomatoes (separately). Set aside. Grind the spinach with 1/4 cup water. Set aside. Heat oil in a non-stick pan, add green cardamom, black cardamom, cumin seeds and cloves and sauté for a minute. Add onion and sauté till browned. Add garlic paste, ginger paste and green chillies and sauté for a minute. Add turmeric powder, red chilli powder and coriander powder and mix well. Add salt and chicken and sauté for four-five minutes. Add tomatoes and cook further for five minutes. Add a cup of water and bring it to a boil. Cover and cook till the water dries up and the chicken gets cooked. Add ground spinach and garam masala powder and mix well. Cook for two-three minutes. Remove Cloves and Cardamoms (if you find any). Serve hot with chapati (Indian bread) or steamed rice.